Jensen is pretty brave, in his daydreams. After all, his super secret skill is knowing about the dangers of sun spots and their effect on the environment and mankind so that he can be an astronaut at NASA one day. But for right now Jensen isn’t an astronaut. Right now, Jensen is stuck in middle school, Berrybrook Middle School to be exact, and he’s being bullied. In the follow-up to her award winning graphic novel Awkward, Svetlana Chmakova has written my personal top pick for 2018’s best middle grade graphic novel to address the pressing and growing issue of bullying in schools; Brave was also noted for an Honorable Mention in the middle grade category for this year’s Excellence in Graphic Literature Awards. 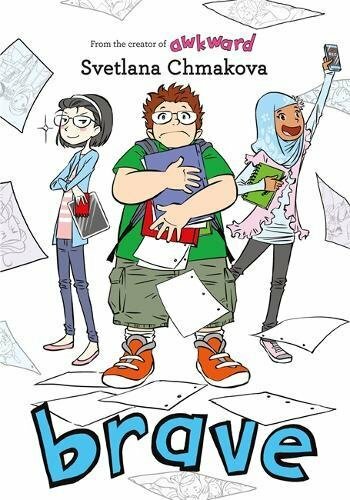 For teachers, librarians, and parents who are searching for a powerful middle-level story for a student (or group of students) who may need to have more awareness about bullying and its impact on people’s lives I highly recommend picking up Chmakova’s Brave. Likable and lovable, Jensen is an endearing character. So, when he gets bullied throughout the story his classmates soon start to reveal their true colors about how far they are willing to go to either do the right thing and stick up for their friend or do the wrong thing and fit in with the crowd. As the story develops Jensen starts to understand what bullying really is, how he is or is not being bullied, and which classmates are honestly good friends. In a coming of age tale all-aged readers can learn from, bullying takes center stage and leaves a lasting impression. Plot: Jensen Graham is being bullied at Berrybrook Middle School and its up to him to find out who is real friends are and are not. As they read, students can cite textual evidence that supports an analysis of the explicit and inferred bullying in the story. To do so, students can use each of the ten Stop Sign-shaped octagons (one for each chapter) to identify an explicit or inferred example of bullying or a solution to bullying in the story. Inside of the Stop Sign-shaped octagon, draw or write out an example of bullying or a solution to bullying found within the chapter. Somewhere around the octagon explain how your selected example influences Jensen’s understanding of bullying at this point in the story.